The Russian Invitation Letter is a requirement for you to obtain the Russian Tourist or Business Visa. The document is in A4 format and indicates that you are invited to Russia by an accredited Russian travel company or a hotel. iVisa provides Russian tourist and business invitation letters depending on the purpose of your trip and whether you are applying for a Russian Tourist or Business (Commercial) Visa. There are 2 different tourist invitation letters – the only difference is whether you need a single or double entry into Russia. Applying for the Russian Invitation Letter is easy and fast with iVisa. The process is 100% online. Travelers simply provide personal and travel information and the Russian Tourist Invitation Letter can be generated in 2 hours. You can print the invitation letter and use it as one of the documents required for your Russian visa. Besides your passport information, you are required to provide your travel dates and accommodation information in order to apply for the Visa Invitation Letter. You will be required to provide information on which cities you plan to visit during your stay in Russia in order to apply for the Visa Invitation Letter. You are not required to book a hotel to apply for the Visa Invitation Letter but you will be asked about your accommodation information when applying for the Visa Invitation Letter. The Russian Tourist Invitation you will receive from iVisa consists of a tourist confirmation letter. Bear in mind that you are applying for a Russian invitation letter and not a Russian Tourist Visa. The Russian Visa Invitation Letter is a requirement for you to obtain the Russian Tourist Visa. After you receive your invitation letter via email, you can apply for the Russian visa at one of their embassies. The Russian Consulate may ask you for your hotel booking or any other proof of accommodation when issuing your Russia Visa. The Russian Tourist Visa, once obtained, allows you to stay in the country for a maximum of 30 days and expires 30 days after your arrival in Russia. 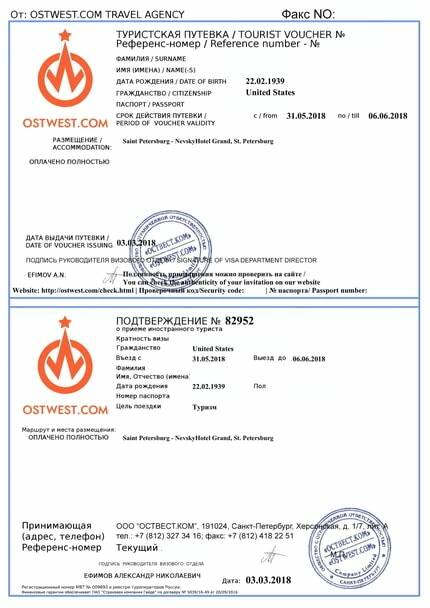 It is a document which indicates that you are invited to Russia by a Russian travel company or a hotel that is accredited by the Ministry for Foreign Affairs of the Russian Federation. This document consists of two parts: A Voucher and a Confirmation of the Admission of a Foreign Tourist. In order for you to apply for a Russian Tourist Visa, you will need to present an Invitation Letter with your visa application. The cost is 25 USD for single entry, and 35 USD for double entry (standard processing). For rush and super rush processing, the cost is 50 USD and 75 USD respectively for single entry, and 60 USD and 85 USD for double entry respectively. Submit the letter as well as all the other required documents for your visa application at the embassy. These typically include: a color visa/passport-sized photo, health insurance, proof of finance, returns flights etc. (iVisa suggest that you consult directly with the embassy nearest to you for a full list of required documents). A hotel booking is not required for at the time of application. However, the Russian Consulate may ask you to provide a copy of the booking confirmation if you have indicated the hotel as your Russian accommodation in the application form to obtain a visa for Russia. What you have received from us is exactly what is required by the Russian embassy for the tourist visa. The document you receive from us consists of two parts: the Invitation Letter and the Confirmation Letter. The Tourist Invitation Letter is a document that must be submitted along with your visa application. It is not an actual visa, but rather a document that the Russian government requires when applying for an actual visa. Can I travel to Russia with just my invitation, without obtaining a visa? No, you cannot. The Tourist Invitation Letter allows you to apply for the actual Russian visa. How can I get my Russia Invitation? iVisa can process your tourist invitation. Simply submit your request online using our Russian Invitation Request Form. Once you submit your request, you will immediately receive a confirmation email. iVisa will then send you an official invitation or telex confirmation by email within a few days. What is a visa support letter? A visa support letter is another name for the invitation, which is required for applying for a visa to Russia. An invitation can be acquired by an individual or by an organization, as long as they are in Russia. You can also use our company’s services when applying for a tourist or a business invitation. How can I pay or with what can I pay for the invitation letter? Anything I need to know regarding the tourist invitation letter? Typical Details in the letter include: name of accommodations and its address etc. What should I do after I receive the invitation letter? After you receive your invitation letter via email, you can apply for the Russian visa at on of their embassies. Submit the letter as well as all the other required docs for your visa application at the embasy. These typically include: color visa/passport sized photo, health insurance, proof of finance, returns flights etc. (iVisa suggest that you consult directly with the embassy nearest to you for a full list of required documents. After your visa interview at the Russian consulate they will issue you your visa if approved. Unfortunately, no. Unless your country is in a visa-free regime with Russia, you are required to obtain an entry visa in order to travel to the Russian Federation. Nonetheless, once you receive your original invitation, you can apply for a Russian visa. Is it necessary to provide exact travel dates on the tourist invitation application or are approximate dates good enough? You can specify your travel time frame, which may not exceed 30 days. Therefore, if you have already bought your tickets, go ahead and provide exact dates. However, if the purchase is still to be made, provide approximate time frame. Just keep those dates in mind when ordering tickets. How can I find the closest Russian Consulate? To find your closest Russian Consulate, please go to “Embassy Listings”. What documents must be submitted to the Consulate of the Russian Federation in order to obtain a visa? When applying for a Russian visa, you will need to submit your original invitation, your passport, 3 photos (3x4) and proof of medical insurance. You will also need to pay the consular fee. To obtain a multiple entry visa, you will be required to submit a recent HIV test results, issued no earlier than 3 months prior to applying for the visa. Russia may not be on many people’s bucket list, but that is mostly because there are a lot of common misconceptions about it. Everyone thinks that Russia is cold all year round and that everyone drinks vodka. While the last one is somewhat true, nobody is making you drink it. Even so, you will find a lot of contrast in Russia. Regardless of many misconceptions, there is a lot of surface area to explore. As with any other country, there are plenty of things you need to know before you hop on the plane, but rest assured that following the Russian etiquette is not that complicated. As long as you keep in mind that Russia is a traditional country, you should get around just fine. The first myth that needs to be debunked about Russia is concerns the weather. Yes, Russia can have some brutal temperatures in the winter, but the mercury in thermometers can easily reach 30 degrees Celsius during the summer. Sometimes, it is even hotter. So if you do not know what to pack, consider the season Russia is in. However, when it is cold in Russia, the problem is not the low temperature, but the water. You need to make sure that you will not get wet. If you go to one of Russia’s cities in the winter, you need to pack waterproof boots and extra pairs of socks. The snow melts very fast in the cities, and it turns into a snowy mud that is able to get your feet soaked in just an instant. Other than that, hats, thick scarves, and gloves are a must in the summer. Russia is a traditional country, but not in a sense you would think. Even so, you need to dress decently at times. For example, Russia is mainly an orthodox country, and if you want to visit one of their churches, you need to obey some simple rules. Men should always wear long pants and have nothing that covers their heads. Women, on the other hand, need to wear a scarf on their head, cover their shoulders and knees. Long skirts are to be preferred, although long pants are more common. Speaking of dress codes, Russians do not wear sandals or flip-flops on the street. It is considered of poor taste. It may be hot, but surely you can find other kinds of shoes that can keep you cool. One of the things that all tourists love when they go to Russia is the cuisine. They have a lot of dishes that are not very common in the rest of the world. One dish that you need to try is the borscht, some kind of beetroot soup. But it is sour, and if you add some heavy cream, you will lick your fingers for days. Of course, there is the possibility of not liking it at all, but you do not know until you try. Unlike the rest of the European countries, Russia’s tap water is not safe to drink. It is recommended that you avoid it. Once you turn on the faucet, brown water will come first before clearing. You should stick to bottled water your entire trip. As for the vodka, something that everyone is eager to know, Russian people do drink vodka. They even drink a lot of it in some parts of the country. However, if you cannot keep up, which is most likely, all you have to do is leave some of the vodka in your glass. It is a sign that you do not want to drink more for the time being. Once Russians open a bottle, they will not stop until it is empty. That is some sort of tradition for them. Leaving a bottle of vodka half full is a bad sign for unclear reason. When you go to Russia, you are expected to respect the local customs. For example, if you go to someone’s home, it is a custom to bring a gift. You do not have to spend too much money on it. It is a simple sign of good will. Dress code is also something Russians hold dear. You will not offend anyone if you are underdressed, but you will feel bad if you go to a restaurant or to the opera in casual wear. When you pack, make sure that you add something formal to your wardrobe. Russia is a very large country, and one of the best ways to get from point A to point B is by train. First class tickets are very expensive, which is why you should travel on the third class. It is not as fancy, but you have a place to sleep if you travel at night. However, do not rely on a train’s kitchen for food. It is either non-existent, or the food is too expensive for the quality it has. Before any trip by train, go to a supermarket and grab something to eat. At least you will not spend a lot of money on poorly made food. One of the many common misconceptions about Russia is that it is not a safe country. However, that is not true. It is quite the contrary, actually. Petty crimes like pickpocketing are common, but so are in other countries. You need to take caution for that to not happen. Keep your bag close to your body when you go out, and avoid flashing all your devices or jewelry. As long as you are cautious, you will be fine. You will have a very good time in Russia. The opera is exquisite in big cities, and you cannot leave the country without visiting the Red Square. Plus, you can bring as souvenirs the famous dolls called matryoshka. The people are generally okay, but they are not as open as in other countries. Even so, with a few Russian words in your vocabulary and respect for their traditions, you will get along with them just fine.